What am I sappy lobster blogging? From the Maine Maritime Museum in Bath, ME . . .
Friday, September 25, 2015, is National Lobster Day! To celebrate, the Maine Maritime Museum’s Lobstermobile will be going on a “Maine Adventure,” making stops at Renys stores in Portland, Topsham, and Bath, and concluding with a party at the museum! Please join us at our National Lobster Day party from 3 to 5 pm on Friday, September 25! 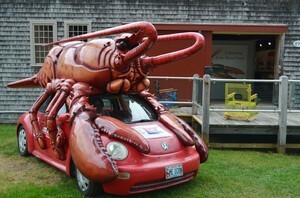 Have a piece of cake with the Lobstermobile and explore the state’s newest, and largest, exhibit on lobstering, Lobstering & the Maine Coast! Admission will be FREE after 3 pm.